steamers making daily trips between the port of San Pedro and that most beautiful of California's islands, Catalina, rightly termed "An Isle of Summer." The great building also is the home of several of Southern California's most important corporations. 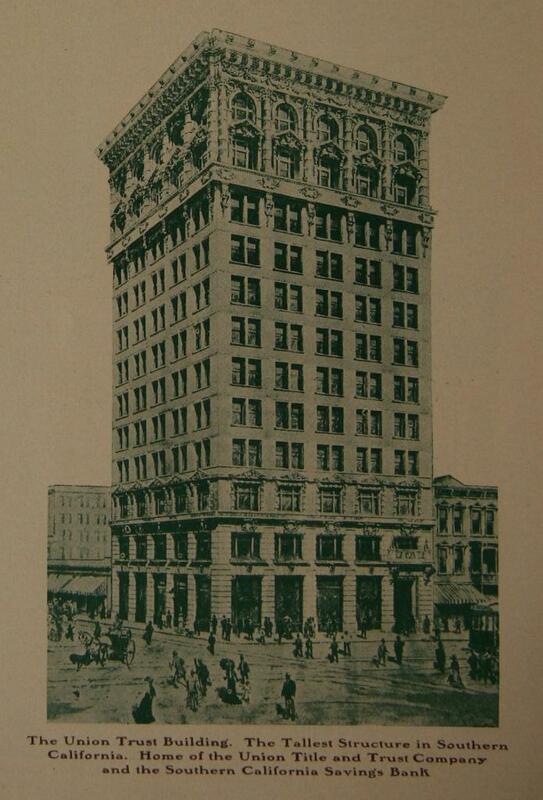 Mr. Huntington's own companies occupy the entire seventh floor, while the general offices of Senator Clark's new and direct railway to the east, known as the Salt Lake Route, are located on the fifth floor. Here also are the general offices of the Wilmington Transportation and the Catalina Island Companies, and the division offices of the Southern Pacific Company. The eighth and ninth floors of the Pacific Electric Building are the home of the Jonathan Club, one of the most important and the largest social organizations in Southern California. Its highly elevated quarters are most elaborately furnished and equipped, while from the principal apartments there are commanded panoramas of snow-capped mountains, green fields, glistening orchards, flower-bowered suburbs, and bustling city streets, giving to this club a novelty of location individual to itself. Gliding northward on Main street, we pass on the left the new home of the oldest financial institution, and one of the most important in Southern California, the Farmers and Merchants National Bank. Its banking house is one of the few in America which occupies an entire building. Architecturally this building is among the most beautiful in California, while its interior is a perfect model, from a banking standpoint, nothing being omitted which might in any way tend to facilitate the transaction of its enormous business. Magnificently constructed and easily accessible safety deposit vaults occupy the basement of the handsome structure.